Time for a trip back in time! We're zipping back to the Roaring 20s, an era of gangsters, flappers, speakeasies, and jazz. But before you step into a super cool speakeasy, we have a few things that need to be taken care of. Because when you beam back in time, your clothes would be just totally out of sync! And we can't have that. If your girl is ready for a historic visit to the 1920s, then we have just the thing for her. This Girl's Red Flapper Costume. A timeless classic, it will have her dressed up in the style of the roaring twenties. No time traveling required! This Girls Red Flapper Costume comes with a slip dress that is adorned with lovely red fringe down the front. Red sequin trim and straps add a dash of flash and a red sequin headband with a feather complete the style. Add a long pearl necklace and silver mid heels to get the look just as we have it pictured, they're sold separately, but make for great additions! We've been selling costumes here for well over a decade, and let us tell ya. 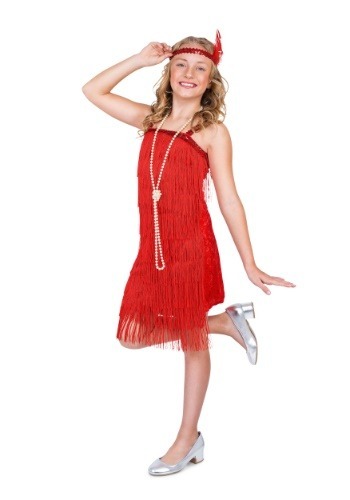 Flapper costumes are one of the most popular styles for women, year after year! Whether she's teaming up with her friends to form a group of Flapper ladies, or even teaming up with some gents dressed as ferocious gangsters, the Roaring 20s theme is guaranteed to be a ton of fun. Check out our entire selection of flapper dresses to see the range of options, we've got them in every color and size!